However, you're assuming that ALL divine words would be written down, that human nature would not allow a single divine word to not be written down. Do you realize how much of an unprovable negative statement this is? All it takes is one example of the contrary to prove you wrong. Do the Hindu sacred writings contain EVERYTHING the Hindus believe? Can ALL the teachings of the Buddha be found complete in the writings of his followers? Did the native tribes of Alaska even bother to commit any of their spiritual tradition to writing? I don't know for certain, but it seems you're making an assertion regarding human nature that reflects a very minuscule understanding of history and cultures. It is within the power of all, therefore, in every Church, who may wish to see the truth, to contemplate clearly the tradition of the apostles manifested throughout the whole world; and we are in a position to reckon up those who were by the apostles instituted bishops in the Churches, and [to demonstrate] the succession of these men to our own times; those who neither taught nor knew of anything like what these [heretics] rave about. For if the apostles had known hidden mysteries, which they were in the habit of imparting to “the perfect” apart and privily from the rest, they would have delivered them especially to those to whom they were also committing the Churches themselves. For they were desirous that these men should be very perfect and blameless in all things, whom also they were leaving behind as their successors, delivering up their own place of government to these men; which men, if they discharged their functions honestly, would be a great boon [to the Church], but if they should fall away, the direst calamity. I will concede that St. Irenaeus certainly supports Dr. Pieper's and your definition of "Apostolic", since the saint identified doctrine as Apostolic if it was what the Apostles taught, but I would suggest that Dr. Pieper's definition of "Apostolic" is incomplete. To Irenaeus, the visible succession of bishops from the Apostles was just as much a witness to Apostolicity of a doctrine as the fact that the doctrine was learned from the Apostles themselves. And, just as St. Ignatius of Antioch taught his flocks to do everything in union with their bishops lest they fall prey to the heretics, so did Irenaeus declare that the truth of doctrine could be ascertained by the fact that those bishops who taught the doctrine were verifiable successors to the Apostles. If you are not in communion with these bishops, how can you know that your doctrine is Apostolic? No, it answers the questions whether the Chrisitans had images in their places of worship (besides the obvious, the inscriptions and literary evidence show worship is what was going on in the catacombs). Your Protestant forebares denied their existence when they were creating the church from whence you come, but then in the 17th century the catacombs were rediscovered, and exposed your forebares' fallacy. Then your Protestant forebares fell back on the waving the veil of Moses, claiming that the Jews don't have images, and so the early Christians didn't either. But now we have unearthed early synagogues, and they are covered in images. So much for that. So now you are left begging the question that the early Christians had no images, with no evidence. Christ said the gates of Hell would not prevail against His Church, the pillar and bulwark of Truth. All those early Churches uncovered have images that cover them. Either call Christ a liar as His Church fell prey to Satan, and hence nothing He said 2,000 years ago has no relevance to us today. There is almost no description of the Chapel's inside. 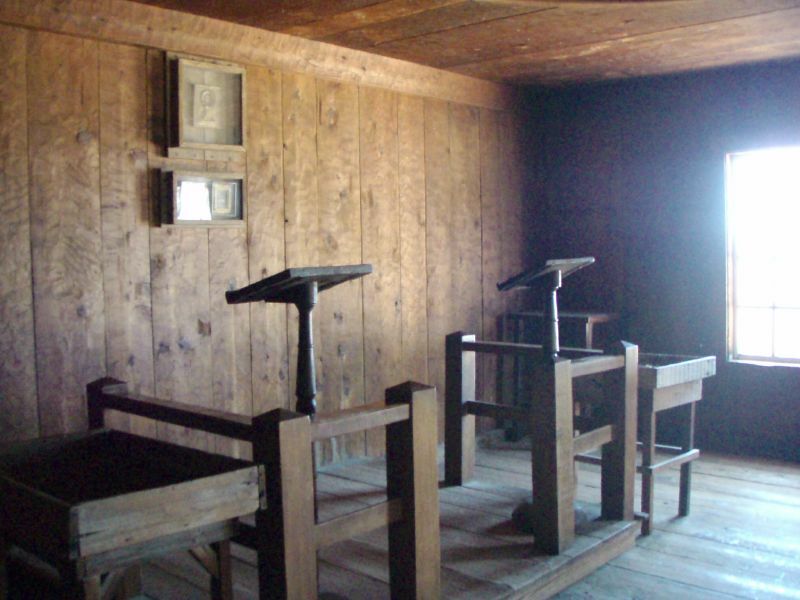 After all, most at Fort Ross had seen the inside of a Russian Church. THere is more detailed descriptions of the governor and manager's home (which also include the icons that were in the rooms, something different for American and Western European visitors). When the Russians evacuated, they told everything with them to the Cathedral in Sitka, except a lectern, the candlelabra and candle stand. As for the early Christian Churches, there is the problem that they a) had to be hidden, as they were illegal, b) were being destroyed constantly, because they were illegal, c) after the peace of Constantine, many old icons had "restoration" jobs which inadvertedly destroyed the earlier layers, d) between the iconoclast emperors and muslim caliphs, many more Churches and icons were destroyed (Mt. Sinai, for instance, has many icons from the two centuries before the iconoclasts which do not survive elsewhere). 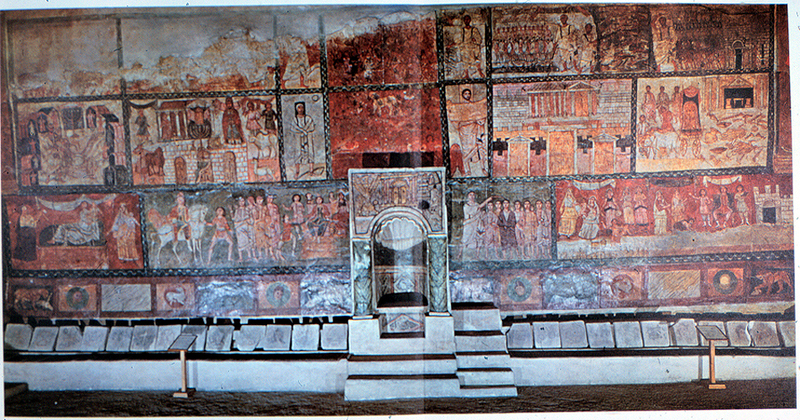 The Church in Dura Europas survives (from a century before Holy Constantine and only just after a century after the Apostle John), for instance, because it was raised in a remote area, in between persecusions, and the whole section of the city where it was located was filled in with rubble to whithstand the Persian invasion shortly thereafter, protecting the site when the Persians sacked it, and it was never inhabited again. Some of the earliest Eucharist prayer texts and a Gospel harmony come from the same site. Only if Christ's promisse that the Church He founded on them would not fall to the gates of Hell, and that He would remain with it all the days until the end of the age, are lies. The catacombs comport with what the Apostles taught, and what their One, Holy, Catholic and Apostolic Church teaches still. I had thought of starting a thread on Perssonism's teaching on sola scriptura, but decided the thread "Sola Scriptura - A Diversion From the True Word of God" would be an appropriate place to taste test, to spew out as poison, Perssonism's flavor of Sola Scriptura. My, in capitals. But I don't see that in that verse. No, not in the original. Maybe in a Latin or Syriac translation or textual varient. Maybe someone can find "only" in some translation or another. but I don't see it in the languages I can read (which are a couple). So Perssionism has made its own translation to suit its own dogma, like the Jehovah's Witnesses. every other source is suspect or it would have been canonized. Your evidence for this (baseless, btw) assertion? The early Church used lots of sources that they did not canonize nor did she doubt; and canonized, for instance, Mark and Luke/Acts (though not Apostles), the annonymous Matthew and Hebrews, and John, despite the fact that he does not identify himself by name. Of much less weight is the testimony of sub apostolic church fathers, presumably some of them were taught either by an apostle, or someone they taught. Yes, your testimony is so much weightier than that of those whom were taught either by an Apostles or someone they taught. Of course, since you do not have the autographs of the Apostles, you depend on the Church who preserved, canonized and copied their writiings for a millenium. To go further away from the apostles begs the question what they apostles taught. So where does that leave you, in the 21st century, with roots too short to connect to the Apostles by centuries, and dependent on the textual witness of the Orthodox Church and the Jews who denied Christ for your scripture? LOL. Who needs your approval? Oh? Is your Bible written in invisible ink? Is it written on the air? As St. John says "Israel of old did not see God, but we see the Lord's glory face to face." If you say that only intellectual worship befits God, take away all corporeal things, light, and fragrance, prayer itself through the physical voice, the very divine mysteries which are offered through matter, bread, and wine, the oil of chrism, the sign of the Cross, for all this is matter. Take away the Cross, and the sponge of the Crucifixion, and the spear which pierced the life-giving side. Either give up honouring these things as impossible, or do not reject the veneration of images. Matter is endued with a divine power through prayer made to those who are depicted in image. Purple by itself is simple, and so is silk, and the cloak which is made of both. But if the king put it on, the cloak receives honour from the honour due to the wearer. So is it with matter. By itself it is of no account, but if the one presented in image be full of grace, men become partakers of his grace according to their faith. The apostles knew our Lord with their bodily eyes; others knew the apostles, others the martyrs. I, too, desire to see them in the spirit and in the flesh, and to possess a saving remedy as I am a composite being. .I see with my eyes, and revere that which represents what I honour, though I do not worship it as God. Now you, perhaps, are superior to me, and are lifted up above bodily things, and being, as it were, not of flesh, you make light of what is visible, but as I am human and clothed with a body, I desire to see and to be corporeally with the saints. Condescend to my humble wish that you may be secure on your heights. God accepts my longing for Him and for His saints. For He rejoices at the praises of His servant, according to the great St Basil in his panegyric of the Forty Martyrs. Listen to the words which he uttered in honour of the martyr St Gordion. The mere memory of just deeds is a source of spiritual joy to the whole world ; people are moved to imitate the holiness of which they hear. The life of holy men is as a light illuminating the way for those who would see it. And again, when we recount the story of holy lives we glorify in the first place the Lord of those servants, and we give praise to the servants on account of their testimony, which is known to us. We rejoice the world through good report. Commentary.—The remembrance of the saints is thus, you see, a glory to God, praise of the saints, joy and salvation to the whole world. Why, then, would you destroy it ? This remembrance is kept by preaching and by images, says the same great St Basil. Just as burning follows naturally on fire, and fragrance on sweet ointment, so must good arise from holy actions. For it is no small thing to represent past events according to life. Blessed Dionysios (the Areogapite) who has made divine things in God's presence his study, says that these representations and images are marked out beforehand. In His counsels, God has noted and settled all that He would do, the unchanging future events before they came to pass. In the same way, a man who wished to build a house, would first make and think out' a plan. Again, visible things are images of invisible and intangible things, on which they throw a faint light. Holy Scripture clothes in figure God and the angels, and the same holy man (Blessed Denis) explains why. When sensible things sufficiently render what is beyond sense, and give a form to what is intangible, a medium would be reckoned imperfect according to our standard, if it did not fully represent material vision, or if it required effort of mind. If, therefore, Holy Scripture, providing for our need, ever putting before us what is intangible, clothes it in flesh, does it not make an image of what is thus invested with our nature, and brought to the level of our desires, yet invisible ? A certain conception through the senses thus takes place in the brain, which was not there before, and is transmitted to the judicial faculty, and added to the mental store. Gregory, who is so eloquent about God, says that the mind which is set upon getting beyond corporeal things, is incapable of doing it. For the invisible things of God since the creation of the world are made visible through images. We see images in creation which remind us faintly of God, as when, for instance, we speak of the holy and adorable Trinity, imaged by the sun, or light, or burning rays, or by a running fountain, or a full river, or by the mind, speech, or the spirit within us, or by a rose tree, or a sprouting flower, or a sweet fragrance. The fourth kind of image are the figures and types set forth by Scripture of invisible and immaterial things in bodily form, for a clearer apprehension of God and the angels, through our incapacity of perceiving immaterial things unless clothed in analogical material form, as Dionysius the Areopagite says, a man skilled in divine things. Anyone would say that our incapacity for reaching the contemplation of intellectual things, and our need of familiar and cognate mediums, make it necessary that immaterial things should be clothed in form and shape. If, then, holy Scripture adapts itself to us in seeking to elevate us above sense, does it not make images of what it clothes in our own medium, and bring within our reach that which we desire but are unable to see ? The spiritual writer, Gregory, says that the mind striving to banish corporeal images reduces itself to incapability. But from the creation of the world the invisible things of God are made clear by the visible creation. We see images in created things, which remind us faintly of divine tokens. For instance, sun and light and brightness, the running waters of a perennial fountain, our own mind and language and spirit, the sweet fragrance of a flowering rosetree, are images of the Holy and Eternal Trinity. I don't believe Eutyches was illiterate, though I know he was a heretic. Do you know who that is? Do you know what "monophysite" (or for that matter, "heresy") means? Besides tossing the terms around, you don't demonstrate any knowledge of what they mean. Christ's human nature is not infinite, as that is against human nature. Like John 1:14? Phililpians 2:7? the illiterate believes represents the prototype. Like John 14:9? Colossians 1:15, 19? Phillippians 2:8? Your assertion, where is your proof? as the heresy grew, iconoclasm grew, prior to that there was no need for iconoclasm. The first iconoclast edict came in 726, with practically no evidence of debate on the matter among Christians, though we have plenty of physical evidence for the prior four centuries of the veneration of icons. Plenty for the iconoclasts, if they had lived, to condmen icons, and plenty of time to do it. Where we see the start and development of the debate is in Islam, in their second civil war c. 690. For one thing, too many Muslims were attracted by the icons and submitted to baptism as a result. So prior to the need to validate and establish Islam as the supplanter of Christianty, Muhammad as the successor of Christ, and the Quran and the fulfillment of the Bible, yes, there was no need for iconoclasm. 1. Carpocrates, again, and his followers maintain that the world and the things which are therein were created by angels greatly inferior to the unbegotten Father. They also hold that Jesus was the son of Joseph, and was just like other men, with the exception that he differed from them in this respect, that inasmuch as his soul was steadfast and pure, he perfectly remembered those things which he had witnessed within the sphere of the unbegotten God. On this account, a power descended upon him from the Father, that by means of it he might escape from the creators of the world; and they say that it, after passing through them all, and remaining in all points free, ascended again to him, and to the powers, which in the same way embraced like things to itself. They further declare, that the soul of Jesus, although educated in the practices of the Jews, regarded these with contempt, and that for this reason he was endowed with faculties, by means of which he destroyed those passions which dwelt in men as a punishment [for their sins]. 2. The soul, therefore, which is like that of Christ can despise those rulers who were the creators of the world, and, in like manner, receives power for accomplishing the same results. This idea has raised them to such a pitch of pride, that some of them declare themselves similar to Jesus; while others, still more mighty, maintain that they are superior to his disciples, such as Peter and Paul, and the rest of the apostles, whom they consider to be in no respect inferior to Jesus. For their souls, descending from the same sphere as his, and therefore despising in like manner the creators of the world, are deemed worthy of the same power, and again depart to the same place. But if any one shall have despised the things in this world more than he did, he thus proves himself superior to him. 3. They practise also magical arts and incantations; philters, also, and love-potions; and have recourse to familiar spirits, dream-sending demons, and other abominations, declaring that they possess power to rule over, even now, the princes and formers of this world; and not only them, but also all things that are in it. These men, even as the Gentiles, have been sent forth by Satan to bring dishonour upon the Church, so that, in one way or another, men hearing the things which they speak, and imagining that we all are such as they, may turn away their ears from the preaching of the truth; or, again, seeing the things they practise, may speak evil of us all, who have in fact no fellowship with them, either in doctrine or in morals, or in our daily conduct. But they lead a licentious life, and, to conceal their impious doctrines, they abuse the name [of Christ], as a means of hiding their wickedness; so that their condemnation is just, Romans 3:8 when they receive from God a recompense suited to their works. 4. So unbridled is their madness, that they declare they have in their power all things which are irreligious and impious, and are at liberty to practise them; for they maintain that things are evil or good, simply in virtue of human opinion. They deem it necessary, therefore, that by means of transmigration from body to body, souls should have experience of every kind of life as well as every kind of action (unless, indeed, by a single incarnation, one may be able to prevent any need for others, by once for all, and with equal completeness, doing all those things which we dare not either speak or hear of, nay, which we must not even conceive in our thoughts, nor think credible, if any such thing is mooted among those persons who are our fellow citizens), in order that, as their writings express it, their souls, having made trial of every kind of life, may, at their departure, not be wanting in any particular. It is necessary to insist upon this, lest, on account of some one thing being still wanting to their deliverance, they should be compelled once more to become incarnate. They affirm that for this reason Jesus spoke the following parable:— Whilst you are with your adversary in the way, give all diligence, that you may be delivered from him, lest he give you up to the judge, and the judge surrender you to the officer, and he cast you into prison. Verily, I say unto you, you shall not go out thence until you pay the very last farthing. Matthew 5:25-26; Luke 12:58-59 They also declare the adversary is one of those angels who are in the world, whom they call the Devil, maintaining that he was formed for this purpose, that he might lead those souls which have perished from the world to the Supreme Ruler. They describe him also as being chief among the makers of the world, and maintain that he delivers such souls [as have been mentioned] to another angel, who ministers to him, that he may shut them up in other bodies; for they declare that the body is the prison. Again, they interpret these expressions, You shall not go out thence until you pay the very last farthing, as meaning that no one can escape from the power of those angels who made the world, but that he must pass from body to body, until he has experience of every kind of action which can be practised in this world, and when nothing is longer wanting to him, then his liberated soul should soar upwards to that God who is above the angels, the makers of the world. In this way also all souls are saved, whether their own which, guarding against all delay, participate in all sorts of actions during one incarnation, or those, again, who, by passing from body to body, are set free, on fulfilling and accomplishing what is requisite in every form of life into which they are sent, so that at length they shall no longer be [shut up] in the body. 5. And thus, if ungodly, unlawful, and forbidden actions are committed among them, I can no longer find ground for believing them to be such. And in their writings we read as follows, the interpretation which they give [of their views], declaring that Jesus spoke in a mystery to His disciples and apostles privately, and that they requested and obtained permission to hand down the things thus taught them, to others who should be worthy and believing. We are saved, indeed, by means of faith and love; but all other things, while in their nature indifferent, are reckoned by the opinion of men— some good and some evil, there being nothing really evil by nature. Due to lenght I'll deal with you and Novatian, whom you have brought up before it seems in a post I haven't seen, later. Actually, St. Irenaeus does not mention the practice of the followers of Marcellina because of the difference between them and the Catholic Church, but because they resembled the practice of the Catholic Church in this, unlike most Gnostics. The gnostics, hating the body and denying, like you, that Christ was really incarnate, had no need for icons, because images and the physical world were the creation of an evil demiurge, the God of the Hebrews. Hence why the gnostic Marcion denied the OT and used only the Gospel of Luke (the only one written by a Gentile, or so the Church tells us), expunged of all references to the OT. Marcellinus attributing the earliest icons to Pilate differs from the Church, who attribute them to St.Luke and the image given to Agbar, but that doesn't seem to have been an enormous problem for St. Irenaeus, seeing how he condemns their "abominations," "madness," etc. In fact, we know that before the Edict of Milan and the Peace of Constantine, some pagans included a portrait of Jesus among their portraits of their philosophers, being chic like Buddhist figures among the Hollywood snobs of today. Where would they get an idea of an image of Christ? We hardly hear a whimper from the iconoclasts until the Muslims raised their hue and cry. And whereas the iconoclasts' policies were only implemented in areas subjugated by the caliphs and iconoclast emperors, the veneration of icons was over the centuries the universal (i.e. CATHOLIC) practice of the Church, as amply demonstrated. LOL. Who's "WE?" Is Christ's True Church so puny that from the rising to the setting of the sun the praise of the Holy Icons shouted it down? No evidence of their theology for nearly a millenium after the foundation of the Church, and then borrowed from the Muslims, the Iconoclasts have no part in Christ Victor. Only in the alternative history of the iconoclasts. I'll stick with the history the archeologists dig up and the sources record, which comport with Christ's promises that His Church would not be overcome by Hell, of which heretics are the gatekeepers and guides. The continuous teaching His Church has passed down, which we celebrate in the Triumph of Orthodoxy, demonstrates that is what to depend on. In the first place, grasping as a kind of pillar, or foundation, the teaching of the Church, which is our salvation, I have opened out its meaning, giving, as it were, the reins to a wellcaparisoned charger, For I look upon it as a great calamity that the Church, adorned with her great privileges and the holiest examples of saints in the past, should go back to the first rudiments, and fear where there is no fear. It is disastrous to suppose that the Church does not know God as He is, that she degenerates into idolatry, for if she declines from perfection in a single iota, it is as an enduring mark on a comely face, destroying by its unsightliness the beauty of the whole. A small thing is not small when it leads to something great, nor indeed is it a thing of no matter to give up the ancient tradition of the Church held by our forefathers, whose conduct we should observe, and whose faith we should imitate. "Why, its a cogent argument. Human nature doesn't allow divine words not be written down, the testimony of history supports that. That's what make Catholic claims to have apostolic tradition from the very lips of the apostles, so unbelievable. If they did, they would have written it down, and canonized it. Icon veneration doesn't happen in a corner, its a public activity. Just as we can locate icon veneration by the "noise" it makes i.e., by the statements of icon venerators in their writings, so also we can determine who is not practicing icon veneration, by the lack of references to it in their writings." It is impossible icon veneration occur without something being written about it, just as its impossible "God speak" without His words being recorded. Whether it everything He ever said, most of it, or just what the "prophet" wants to reveal, is irrelevant to the analogy, and you know that. The point is, God does not speak without the event being written down. You have no answer and so use debate tactics to change the subject from the total absence of icon veneration in the bible, the apostolic church, even in the sub apostolic fathers. It is impossible icon veneration occur without something being said about it, just as its impossible "God speak" without His words being recorded. Whether it everything He ever said, is irrelevant to the analogy, and you know that. Not one word, not one hint, not one allusion, NOTHING. Clearly icon veneration is not apostolic practice. It is a valid statement, you said that Human Nature would not allow for divine words to not be written down, however you would have to make the assumption that ALL divine words would then be thus written down due to human nature. That is not a tactic, it is logic. The testimony of history supports the fact that men make errors. Again, as I have stated before, Jesus is the Word of God and we have from the time He was about 12 to the age of about 30 where nothing was written down about Him. We have no record of what the Divine Word said during this time, so obviously human nature did allow for divine words to not be written down. If the four canonical Gospels and a few excerpts from the Epistles, records everything the Lord said in His three year public ministry, He must have been awfully quiet and pretty wordless for being the Word of God. But, as the Apostle and Evangelist John the Theologian records, the whole world could not contain the books that could be written were all the Lord said or did written down. "Why, its a cogent argument. Human nature doesn't allow divine words not be written down, the testimony of history supports that. What testimony of history do you have for this otherwise unsupported assumption that human nature doesn't allow divine words not be written down? Do you realize that this requires solid evidence from history? Do you also realize that according to the logic of your statements, you need to prove from the historical record that EVERY utterance understood to be of divine origin was written down, that NO utterance of "divine" origin failed to find its way into writing? Are you up to the task of proving that no exceptions exist? For that's what you'll need to do. We have, from tradition, the Apostle Luke painting several icons as well. The same can be said about the New Testament canon, and yet I bet you own and read a New Testament. By the way, you never answered my question about the Shroud of Turin. Do you believe it is authentic? deduction, as human nature does not allow the Orthodox religion be silent about icon veneration, wherever human religion is silent about icons, they aren't like the Orthodox. So, since the Ehtiopia Orthodox do not talk much, barely at all if at all, about icons, that means they don't have them? Converesely, since the Jews in the Talmud write against images of the pagans/Gentiles, and do not expound on their own images in their synoguoges the Jews must not have had them, and so the early Christians couldn't. We can't even say that all those who wear the veil of Moses over their sight come away believing like you after you went back and walked with the Lord no more. Then you are not looking nor listening. As posted several times, the Apostles write much about "the icon of the invisible God" (Col. 1:15). 15For this people's heart is waxed gross, and their ears are dull of hearing, and their eyes they have closed; lest at any time they should see with their eyes, and hear with their ears, and should understand with their heart, and should be converted, and I should heal them. (2Cor. 3:)4 And we have such trust through Christ toward God. 5 Not that we are sufficient of ourselves to think of anything as being from ourselves, but our sufficiency is from God, 6 who also made us sufficient as ministers of the new covenant, not of the letter but of the Spirit; for the letter kills, but the Spirit gives life.7 But if the ministry of death, written and engraved on stones, was glorious, so that the children of Israel could not look steadily at the face of Moses because of the glory of his countenance, which glory was passing away, 8 how will the ministry of the Spirit not be more glorious? 9 For if the ministry of condemnation had glory, the ministry of righteousness exceeds much more in glory. 10 For even what was made glorious had no glory in this respect, because of the glory that excels. 11 For if what is passing away was glorious, what remains is much more glorious. What do you think is the mirror we are looking in? 2Cor. 4:3 But even if our gospel is veiled, it is veiled to those who are perishing, 4 whose minds the god of this age has blinded, who do not believe, lest the light of the gospel of the glory of Christ, who is the icon of God, should shine on them. 6 For it is the God who commanded light to shine out of darkness, who has shone in our hearts to give the light of the knowledge of the glory of God in the face of Jesus Christ. Read the Gospel book He holds open. 2Cor. 5:19To wit, that God was in Christ, reconciling the world unto Himself. if the evidence were so overwhelming, you should be able to produce a gramm. and come back and tell us how the Russian Orthodox didn't have icons. LOL. If I was interested in reality TV or crosswords, I wouldn't bother with your posts. Careful, your martyr complex is showing. So we should remove the "St." from "St. Paul"? I Cor. 15:8And last of all he was seen of me also, as of one born out of due time. 9For I am the least of the apostles, that am not meet to be called an apostle, because I persecuted the church of God. 10But by the grace of God I am what I am: and his grace which was bestowed upon me was not in vain; but I laboured more abundantly than they all: yet not I, but the grace of God which was with me. Its common sense...what prophet do you know keeps his mouth shut and hides in closet, never letting anyone know God spoke to him, never putting the message in writing? BUT your Debate Stratagem #7 "Change the subject to the analogy" won't fly, because I have something better than an analogy...the Orthodox themselves. You gents can't restrain yourselves when it comes to loudly proclaiming your love for images...just review this thread...icons galore! The Orthodox are my proof, if the apostolic church were like the Orthodox church today, the NT would shout about icons from the roof tops! Instead of Orthodox comments about their beloved icons, not even a hint, not one word, not one allusion, not one implication, not one reference, nothing at all. The ONLY likely reason for the complete and total lack of icon veneration in the Bible, is they didn't practice it. BUT your Stratagem #7 "Change the subject to the analogy" won't fly, because I have something better than an analogy...the Orthodox themselves. Somebody is in denial (^). How much longer can this "THIS IS WHAT THE BIBLE PROCLAIMS" "Refutation" "NAH UH (use same, refuted stance)" go on? Really now. We have more than indulged you, but you have done nothing but ignore the evidence put forth to you. Hairbrained ahistorical mugwump comes to mind here. The reason that icons are important enough to Orthodoxy today so that they will defend them loudly is because people like you killed, maimed, mutilated people and destroyed property in your zeal to be right about some sort of mocked up prohibition against images of all kinds. Why they continue to address you is beyond me, because this "discussion" stopped making real sense several pages ago. By this same reasoning, if the Bible itself and alone was meant to be the only basis of our faith, would not the New Testament shout about IT from the roof tops? Or at least mention a "book to come" over and over again that is supposed to be the be-all and end-all of matters of faith? Because I'm not seeing the coming existence of the NT being shouted from the roof tops in the pages of the New Testament. Eh, don't tell anybody else I told you this, but confidentially "Change the subject to the analogy" is actually Debate Stratagem #9 in our handbook. Debate Stratagem #7 is actually "Let's all go get a beer." So you admit your icons are of Christ's flesh only, not the whole Christ, for then you must include His transcendent nature. Nestorian error. BUT I can't let your equivocation fallacy slide, the deception is subtle indeed. So you took what applied to Christ's Person as the Eternal Son, and applied it to His human flesh, to bring Him down to your level, make Him as small as one of His creatures, about the size of a tiny icon...only then are you able to worship Him. While that is sad indeed; the subtle equivocation fallacy meant to deceive, is now exposed. Or do you confess ignorance about the equivocation fallacy in your argument...perhaps you were seduced by that subtle deception yourself? So you took what applied to Christ's Person as the Eternal Son, and applied it to His human flesh, to bring Him down to your level, make Him as small as His creation, about the size of an icon on a wall, only then can you worship Him. Christ brought Himself down to our level, for which we give glory to God. So you took what applied to Christ's Person as the Eternal Son, and applied it to His human flesh, to bring Him down to your level, make Him as small as one of His creatures, about the size of a tiny icon on the wall...only then can you worship Him. While that is sad, the subtle equivocation fallacy you thought would deceive me, failed. I can be a Perssonist now? "...so that he might exclude all heathens and heretics with their images, proving that he is God who is not made by the hand of an artificer.﻿18﻿ Nor is he some God whom heretical ingenuity has devised. A heathen cannot be a heretic, only those who dissent from "officially accepted dogma" can be heretics. Therefore Novatian condemned BOTH the heathen, and the image venerating heretics of his time. Ever looked at an icon of Christ, Alfred? Noticed the halo around His head? Noticed the Greek letters O W N in that halo? What do think those letters mean? Exodus 3:14, Luke 22:70, John 8:58, John 13:19, for starters. Therefore Novatian's condemned BOTH the heathen, and the image venerating heretics of his time. Last time: Novatian's problem was with Christians who had offered sacrifice to Roman gods in order to get out of persecution. His definition of "heresy" was forgiving the people who offered sacrifice to Roman gods, idols, images of things invented in the derangement of base men; the Church which forgave them (after a strict penitence, not the Evangelical "I'm sorry I won't do it again") was in the eyes of Novatian the "heretics with their images". ...as the doctrine of the Trinity developed since there is no singular scriptural passage which actually expresses the Trinity. Early apostolic & subsequently martyred Christians read the Shepard of hermas in some churches since it was considered scripture in many churches (they probably do not count as "Bible loving" according to your distrted preaching in the tradtion of man). Have you no shame? Catholics claim credit for the Holy Trinity, when most of the bishops were Orthodox, now according to you, the Orthtox invented the doctrine. Don't you realize that would invalidate it? "but about the faith they wrote not, `It seemed good,' but, `Thus believes the Catholic Church;' and thereupon they confessed how they believed, in order to shew that their own sentiments were not novel, but Apostolical; and what they wrote down was no discovery of theirs, but is the same as was taught by the Apostles.-Councils of Ariminum and Seleucia, Part I. History of the Councils, Athanasius. All Catholics and Orthodox claiming to have invented the Holy Trinity, should be ashamed of themselves. That not only misrepresents the truth, it fuels the cults who will agree with you, and cite your words as proof its a "man made doctrine." Is there no limit to what you will sacrifice for your beloved icons? Even if we were the beer still needs three more days to fully ferment. Mmmm fresh beer on a feast day. Ever hear of Christ, or what He said on the subject? I'm sure it's easier for you to hear Him up there on your cross. ...Since when is it grave robbing to give someone a proper burial? I guess Moses was a grave robber for transporting Joseph's bones from Egypt to Canaan. No, he didn't sell them to the highest bidders all over Europe and the Middle East. My face is not disfigured, and I have anointed my head and washed my face, therefore I have obeyed the command of the Lord... It helps to understand these things when you put them in context... But you would Know nothing of that. What is your answer to this, Alfred? I'm going to have to call you out on anointing your head. I happen to know you don't have enough hair! Where? No icons are mentioned in those fathers directly after the apostles, none, zero. Sola scriptura is taught, but to speak of that now is to change the subject away from the very embarrassing fact (for you) that icon veneration is completely absent in both the Bible AND the earliest church fathers. That it developed centuries later I freely admit, but that apostasy is irrelevant to what the apostles taught. Only because the military demands it so... but that does not stop me. Or if I do not mention that I have a computer (though evidence suggest otherwise) then I must not have a computer and these post are here by revisionist history alone. Ok, lets change the subject from the embarrassing fact icon veneration is no where to be found in the apostolic church, to anonting. These represent spiritual reality, when the Holy Spirit comes down upon a prophet, He rests upon His Head and face, touching only the spirit of the man. Why did Paul say we walk by faith, not by sight, when the Orthodox walk by sight, and have faith only because what is insensible has now been rendered sensisble? Why didn't Paul speak of our need for the sensible as John of Damascus did? If, therefore, Holy Scripture, providing for our need, ever putting before us what is intangible, clothes it in flesh, does it not make an image of what is thus invested -Apologia of St John Damascene Against Iconoclasts, Part I. Why did Paul say we walk by faith, not by sight, when the Orthodox walk by sight, and have faith only because what is insensible has now been rendered sensisble? You're right. An insensible faith is so much better. Plug your ears at the next reading of the Gospel. Reading and braille are right out too. Glad to see you concede defeat on the icons. Alfred, it was getting pretty embarrassing to watch. Hmmm... I fail to see the link you tried (and failed) to make to anointing...your context fails you yet again... Have you ever thought about maybe actually reading the Bible instead of picking your arguments from half quoted bits of scripture? Your arguments might have better ground that way. You misstated my reasons. More accurate: If you have a dog then your neighbors hear it barking often, if they never hear barking, its likely you don't have a dog. So also icon veneration, where there is icon veneration, there is "barking" about it, where barking is not heard, there is no icon veneration. Therefore the apostolic church did not venerate icons. Maybe they don't hear my dog barking because he's quiet and well-behaved. You prove icons teach the illiterate lies about God, they won't know what those letters are either...they will assume the whole God is being represented by the one icon, which is monophysite heresy.